Stella's Musings: Fighting desertification: how about some regional cooperation? There we were – journalists and experts from different countries, discussing, exploring a common problem: Desertification, Drought and Land Degradation (DDLD). It was eating up our land, pushing us at equal risk of losing food security. Yet there were absolutely no words on how we could fight it – together! Feeling the moving sand: the sand is constantly shifting, which means, the effort to create a green cover must also remain constant. I was in Inner Mongolia from 22nd to 25th. If you didn't know this already, the land of Genghis Khan is actually divided into two parts: outer and inner Mongolia. While Outer Mongolia is an independent, sovereign country, Inner Mongolia is actually a province within China. I was in the latter part, in its biggest city called Chifeng (locals pronounce it as ‘Chrifong’) where the United Nations Convention to Combat Desertification (UNCCD) organized a media workshop on desertification, drought and land degradation (DDLD - an issue that affects over 1.5 billion people globally) in collaboration with the government of China and Xinhua News Agency. Altogether, there were journalists and experts from 10 Asian countries. On the first and the third day of the event, activities were held indoor. We heard a team experts throwing light on a number of matters related to DDLD: the what, why, where, when and how. But the 2nd day was set aside for a field trip. 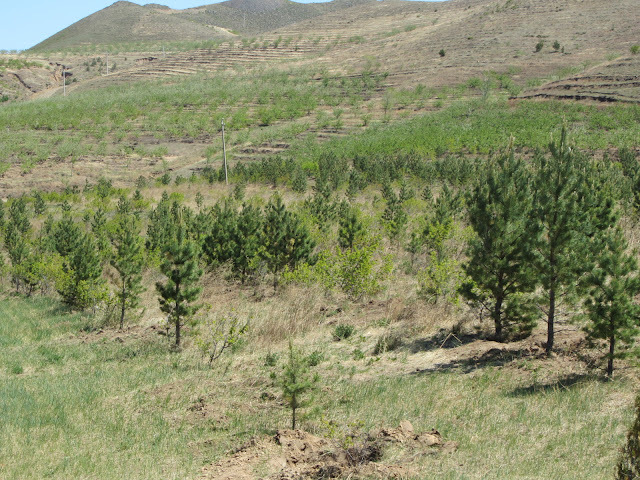 The trip took us to three specific spots where the forestry department of Mongolia, the locals and the federal government of Beijing were running some ‘combat desertification’ projects with the best possible tool: aforestation. The three projects sites were Qihetang (pronounces ‘Xihetang’) n Linxi County, Sudu in Wengniuta County and Taipingdi in Songsan County. the sand dunes – dotting the landscape of entire Inner Mongolia, were advancing at an alarming rate; day and night storms of dust rose from the dunes, blinding people who lived close by and covering their homes and the surface of their land. Then the soil of their farm got so dry, it was ‘dead’ – incapable of food production. Then the people and the government pulled themselves together and decided to fight back the sand. They stopped regular cultivation for a few years. 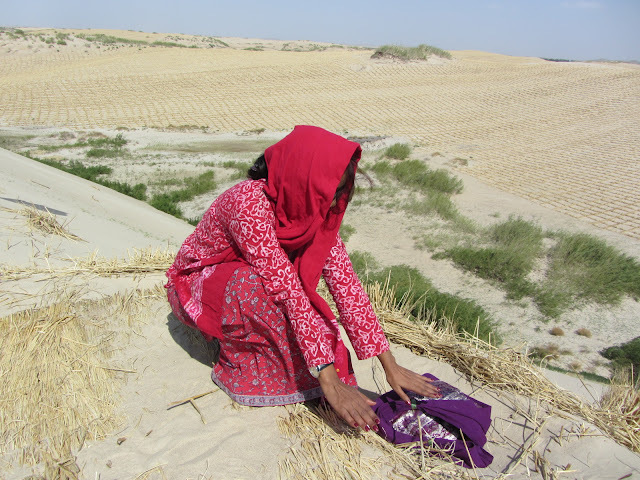 Instead they started planting trees – mainly shrub varieties that can spread root through the sand and live through the scorching heat and wind. This stabilized the sand, and the trees grew which created a light cover of green over the sand dunes. As a result the sand storm also fell weak or stopped completely and the dead soil of the farm gradually came back to life. A very happy story indeed! And this is the very reason why this story is now regarded as the best example of combating desertification in the world. Now, as I listened on, a flood of questions came crowding my head. 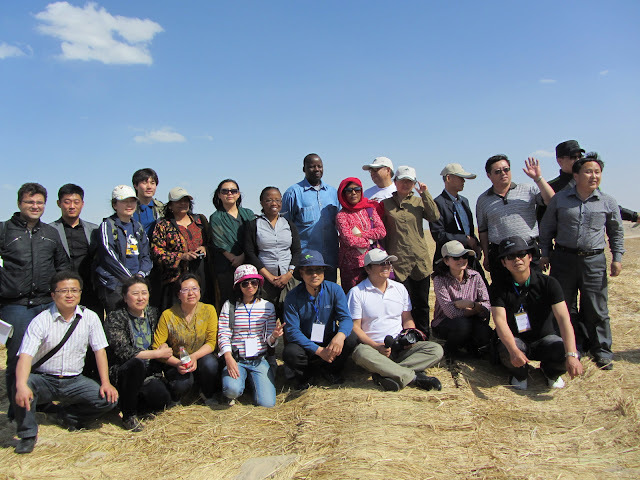 There is no doubt that the projects in Inner Mongolia were very successful. But what kind of challenges did they – the farmers and the government – passed through to script this success? How did the people react when the government first suggested that they stop cultivation altogether and instead just plant trees? What was the level of protest and criticism? How many voices grumbled? How did they pacify those people? How long did it take for everyone in the community to agree and participate in the projects? Did the young men work alongside their old folks? Or, did they just leave and went to the city to find a better life? Now, some of these very questions were asked aloud by my fellow journalist friends – especially those from India. But the answers never came. We were just told that the government didn’t force any decision on anyone and that people themselves realized what was good for them and they did it. To me, this is too idealistic to be true. It almost never happens in reality. A happy story: In Qihetang village of Linxi county, years of plantation have turned the sand dunes into dotted hills of green! Besides, for me, it is these unanswered questions that actually hold the key to real knowledge that can help anyone else in any other country to try a similar project and run it successfully. The other question that kept coming back to my head was, ‘why is the UNCCD not stressing on regional cooperation on fighting desertification?’ To put things into perspective, here we were – journalists and experts from countries across Asia to discuss a problem that we had in common: DDLD. We were all affected by it; it was eating up our land, pushing us towards food insecurity. Yet there were absolutely no words on how we could fight it – together. So, to me, it would have made more sense if the UNCCD had a direct message like a call for the region to unite against desertification. For that matter, it could have thrown ideas on the table like how China, with its proven track record, could play a team leader to its neighbors in combating DDLD. 1) In Mongolia, the Chinese officials said that they owe their success to a ‘holistic’ approach: fixing sand dunes, treating the degraded land, providing economic packages to farmers, changing lifestyle patterns ALL AT ONE GO. Wouldn’t it be great if there was a common forum for affected countries to share this holistic approach and replicate the success that China has? 2)Then one of the panelists – Prof Hoduck Kang, who is a scientist in Dongguk university of South Korea – said that in Korea they had been using a new technology to plant trees that produced faster, better results. Wouldn’t it be better if every country – including China – adopted this method and attained quicker growth of forestation? Regional action at the political/expert level can work well even for us media as well. Consider this: During the event, while hearing of China’s success stories I kept wondering: what are other countries doing? Are they following a ‘singular approach’ like only treating the land? How much success have other countries got so far in combating desert? What are the techniques – both new and traditional –are they using? But I didn't get the answers. The UNCCD is one of the newest and little known UN agencies. But, Mansour N’Diaye, the chief of cabinet in UNCCD made it very clear that the issue that his agency was dealing with was crucial to attain the global goal on sustainable development (after all, how could the world have sustainable development without having enough land for producing enough food to feed its population?) and was committed to combat DDLD. The team of journalists, UNCCD staff, and Chinese government officials: There must be more such meets, with greater exchanges of information. On that note then, I strongly feel that, the UNCCD must moot regional cooperation in sharing of expertise and technology and also for greater exchange of information. After all, four hands are better than two, whether it is in containing sand or planting a tree. Fascinating, Stella, and wonderful you got to see this and share it with us. Good questions that you are asking, as always! These are such great examples of how people are creating change themselves, once they have the knowledge to do so. Thanks and gratitude, Rosemary. Those links you shared - they are so enriching! I truly, deeply appreciate this! Last week I had written my first story post the workshop (http://digitaljournal.com/article/325788) and there also a reader from Spain shared a great story of fighting desertification. Its this exchange of information that really keeps our hopes high, isn't it? Thanks for sharing this information. Where I live we are suffering a sever drought, and I think that trough sharing knowledge we can make things better. Thanks very much! I appreciate your thought. Exchange of knowledge and ideas can indeed help communities across the world!